Tesla, which has faced criticism from its investors about a lack of independent directors, named 21st Century Fox CEO James Murdoch and Ebony Media CEO Linda Johnson Rice to its board. At Long Grain in Camden, Maine, the dish to order is kao klug kapi. Rich and refreshing, this fully loaded rice dish is tasty enough to make even staunch Yankees forgo lobster rolls. The outdoing artistic director of Shakespeare’s Globe lays bare her reasons for quitting. All Natural / Gluten Free / 0G Trans Fat Per Serving! Take the Vegetable Curry & Rice to go with its mild sweet curry flavor with rice, raisins and vegetables. Yellow Rice Prepared for Wedding Ceremony Wall Mural by Richard l’Anson. Product size approximately 48 x 72 inches. Available at Art.com. Embrace your Space – your source for high quality fine art posters and prints. Yellow Rice Prepared for Wedding Ceremony Giant Art Print by Richard l’Anson. Product size approximately 48 x 72 inches. Available at Art.com. Embrace your Space – your source for high quality fine art posters and prints. Yellow Rice Prepared for Wedding Ceremony Photographic Print by Richard l’Anson. Product size approximately 18 x 24 inches. Available at Art.com. Embrace your Space – your source for high quality fine art posters and prints. Our delicious Teriyaki and Rice Meal Ready To Eat (MRE) will make any situation look better. Great for camping, emergencies, backpacking and more. Mike Ragogna: Good This Morning, Anthony! MR: You’ve been in journalism for over thirty years. When did you start focusing on interviews? AM: Well, it was kind of an accidental transition. What happened really was I saw a colleague of mine, a cameraman named Ron Dean who was out shooting a story one day on 25th street. I asked him what he was doing and he told me he was shooting some B-roll for a piece on Patti Scialfa who is Bruce Springsteen’s wife, who I’ve been a huge fan of. I said, “Oh really? That’s really cool, who’s doing it?” and he told me that Jim Axelrod was doing it and I was like, “Damn,” because I really would’ve loved to do that story because I know all about her music and I went through a divorce, frankly, with her album. If you know Patti’s first album Rumble Doll, it’s basically a conversation with Bruce’s album Tunnel Of Love. They’re two sides of the same event, his divorce, her trying to get him to jump when he won’t, it’s a conversation which if you full know know what went on is very interesting. My now wife’s favorite album during my divorce was Rumble Doll and mine was Tunnel Of Love. That’s why I was particularly interested when Ron was shooting this stuff, and why I was lioke, “Well damn.” So I went to the guy at Sunday Morning who was kind of in charge of doing that stuff and I said, “What’s the deal?” and he said, “We’re doing this piece on Patti and ultimately, we hope to do a piece on Bruce, too.” I said, “Well who’s doing that?” and he said, “We don’t have anybody yet,” so my hand shot up right away and I said, “I’ll take that.” That was actually the first music profile that I did. Way to start at the very top, right? That was kind of terrifying because when you’re in the news business–I had never wanted to do celebrity profiles, I just hadn’t been interested, and I certainly hadn’t been interested in doing stories on actors and actresses because I found them sort of impenetrable the few times I’d done them, but music was a different thing for me. When I was a kid, I wanted to be a DJ. Up in my attic somewhere, I have hours and hours and hours and hours of tapes I made of me being a DJ in my imaginary radio station. MR: You should broadcast someday! AM: I don’t know, I haven’t heard them in literally twenty-five or thirty years. That is, if the tape hasn’t disintegrated, because it’s literally on cassette. But I had a really good time doing the Bruce piece as terrified as I was of it. Then they said, “We’ve got this other piece, are you interested in doing something on Neil Diamond?” and I was like, “God, yeah, sure,” because it’s not something some people like to admit but I’ve always been a big Neil Diamond fan, too. So those were the first two that I did and I was like, “This is really interesting. It actually played into a whole side of me that I’d never really gotten to in terms of basic journalism. That’s what kicked the whole thing off. I started looking for more to do and it took on a life of its own. I’m not really quite sure how, but it did. MR: What age were you when you made this transition? AM: The Bruce piece was 2005, so I was forty-nine. MR: Journalism’s been your career all along, right? AM: I started pretty much right out of college, my first job was in Tulsa at a station called HARH. I’ve been doing it for almost thirty-four years, now, thirty two of them with CBS. MR: What got you into journalism? AM: My father kicked me out of the house. [laughs] I’d always been interested in it, I had a lot of interests as a kid. I literally volunteered for my first political campaign when I was eight years old in 1964. LBJ FOR THE USA was this enormous sign across from the bus stop I used to get off at from school. For some reason, it just fascinated me, and I walked in one day and said, “I want to help out with the campaign.” There wasn’t really a political agenda involved that I recall. I couldn’t tell you why I walked in other than I thought the sign was really cool. MR: I had the same thing happen with me as a kid in New York with Andrew Stein. I had no idea what his political affiliation was but I knew I wanted to work for him. AM: I know, it’s so funny. I loved political campaigns as a kid. I loved being part of them, I loved the hoopla, I loved the bumper stickers and buttons and all of that. I just loved them. From the time I was eight until I got into college almost every time I was off from school I’d be working on a political campaign somewhere. In seventh and eighth grade in the summers there was a guy who ran for state assembly and I used to campaign with him at subway stops every morning and every afternoon. I was really into politics. I always loved television as a kid, I had my own imaginary TV station, I literally gridded out the entire programming schedule in a school notebook, I stole all my favorite shows from the other networks and then made up my own. Everything I did was being televised in my head, if I was playing a basketball game with a Nerf ball off my closet I was doing play-by-plays and picking camera angles, I was just always like that. In high school I was the editor of the paper and in college I was the features editor of the paper, so I was always into all that stuff–although when I came home, I’ll be honest with you, I moved in with my dad in New York when I got out of Georgetown and I had no idea what I was going to do. I had no plans or anything and dad looked at me one day about two weeks after I’d moved back in with him–I hadn’t lived with him since my parents got divorced when I was like six–and he just looked at me and said, “So what are you planning to do with the rest of your life?” I said, “I’m going to write a novel,” and he looked at me and said, “not in this house, you’re not.” He, God bless him, had sort of realized over the years that I’d always had a TV camera running in my head and that’s probably where I should go. My cousin had gone to Memphis and was the anchor at the TV station, so he sent me down there to meet with them. One thing led to another and the company that hired my cousin ended up hiring me at Tulsa. That’s how I got started. MR: Did it ever become a mission of sorts? AM: No, you know how it is. You’re always trying to grow somehow–at least I always am. I’m always trying to get better. I’ve always been very detail-oriented. Television, for me, is as much about the making of television as it is about the journalism. 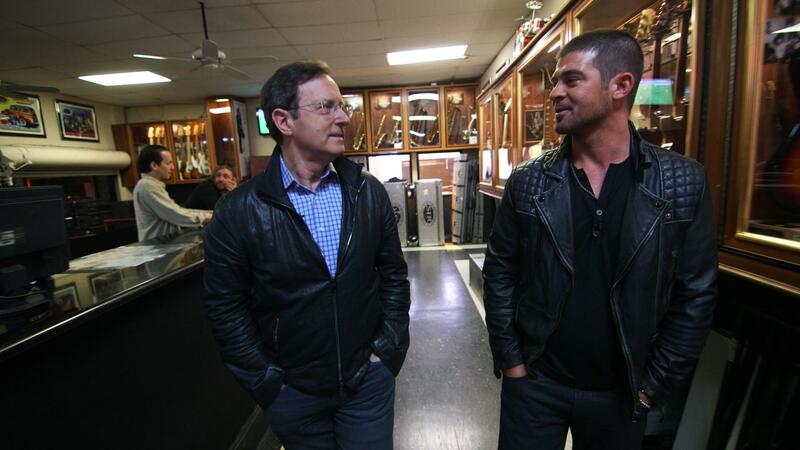 CBS is a very story- and piece-driven network. It’s unlike cable where you’re just trying to constantly spit out news and keep moving. CBS has always been a show-driven network which focuses on pieces, like Sixty Minutes, like Sunday Morning, or evening news in a smaller format. The craft of making pieces and the detail in those pieces is something that I always liked anyway to begin with, but it’s something that has always been paramount at CBS and probably the main reason why I’ve never left. I’m the kind of guy who will sit in the editing room working on Sunday Morning pieces and it’s not unusual for me to be there until one o’clock on Sunday morning making sure every little damn thing that I have in my head and want to be in that story is there. Particularly with music pieces, I don’t know what it is but I feel a duty to the artist that I’m involved with, that I get the details of it right and the tone of it right. I try to make the pieces feel like the musician if you know the musician at all. It’s very daunting, as you probably know, to do a piece on somebody like Springsteen or any major artist for that matter, because they have an enormous fan base and if you screw it up and are not fair or get the details wrong, they’re going to rain holy hell down on you in social media or anywhere else for that matter. It’s not that I’m scared of that reaction but when you’re telling a story about somebody, you’re talking not only to that fan base but also to people who really don’t know anything about them, so you have to tell two stories in one. You have to actually offer something up to the people who are huge fans, but you also have to offer up a story that introduces other people to this artist. It’s very challenging but it’s very interesting as well. That was the part that I found most intimidating in the beginning. I had never been a big interviewer and had never really tested myself that way. In fact, had largely spent the first twenty years of my career at CBS trying to write myself out of every story so that all you saw was the character in it and you didn’t really see me, but I realized that if you’re going to do an interviewing segment you have to be part of that in some way, you have to have a personality, but you don’t want that personality to overwhelm the story you’re doing, so how do you develop an interviewing technique that has its own personality without that personality becoming the focus, which I see people do often and I don’t like. MR: Do you have any examples? AM: God, that’s tough. It’s hard for me to judge because I judge by a different scale. I’m really picky about a lot of little things. But we did a piece with Van Morrison for Sunday Morning early on and I had heard a lot of things from a lot of different people in the music business about how incredibly difficult he could be and how much he doesn’t like to talk. It was among the more enjoyable days I’ve spent doing this, because we had a really good time talking. He obviously was reticent to talk but for some reason, he did talk that day. It was one of those moments where I remember sitting across from somebody and thinking, “My God, I’ve been listening to your music my whole life and I don’t think I’ve ever seen you speak.” It was really stunning because there aren’t many people who are well known like that who you’ve never seen in any kind of lengthy conversation. Even going back, looking at old clips of him, there aren’t that many. There’s very little of Van Morrison actually being interviewed anywhere. I’m always trying to make the artist relax and understand that I appreciate their craftsmanship, because I do. I’m not an in-your-face kind of interviewer; I’m a draw-you-out kind of interviewer. I try to leave the space open and let them come fill it. I find particularly with musicians that’s what they want. They don’t want to talk to a fan. That kind of scares them, actually. I don’t go in asking them, “Why did you do this on the third track of your fourth album?” The obsessiveness of some fans kind of scares them. I talk to them like they’re people like me. The tone I’m always trying to take is to create an environment where if I’m sitting on the sofa with the artist, the viewer is sitting on the arm of the sofa just listening in. It’s not an interview, it’s just a conversation about certain episodes in this person’s life. MR: What do you think is behind the big success of CBS morning talk shows? Two weeks ago, we did a two and a half minute piece introducing Lake Street Dive and then they played two songs. My whole philosophy was people are interested in people. If they find you interesting as a person then they’ll be interested in what you’re doing. That’s kind of the pathway that I’ve taken with music. If you look at the Sunday morning pieces I do–I always tell the artists, because they’re always trying to promote an album, I say, “We don’t do stories on albums. We do stories on people.” An album may be part of that story in some fashion. One of my favorite pieces we did earlier this year was on Rosanne Cash, an album that came out of a return to her own roots and her father’s beginning, they were redoing her father’s boyhood home in Arkansas. That’s what we focused on, her whole trip back to the south, which she’d kind of run from her whole life. That’s how the show used to do it some years ago, but it stopped. We don’t want just anybody who’s passing through town, we want the best musicians we can get and when we can we want to tell their stories as well as have them perform. We had Norah Jones in taping with Puss ‘N’ Boots who are her two friends Sasha [Dobson] and Catherine [Popper]. Jackson Browne is coming in, Tori Amos is coming in, John Hiatt is coming in, we’ve set a bar high for ourselves and said, “We want really talented people, we want them to know that we’re serious about putting good music on television and we want to do it every week and we want to build a reputation for that.” It started last year after I’d done a piece on Aaron Neville on Sunday and I’m like, “I want to get Aaron Neville” on the Saturday show. It took us about four or five months but we made it happen, he came on right before Christmas. When Brian Applegate, the senior producer, saw we did that he suddenly reached out to get The National. I was like, “Wow, that’s a reach,” but we got them for Grammy week and we were like, “Okay, we’ve got something going here.” We’ve kind of been on a roll ever since, musically. We’re booked now all the way into September with the names I just told you. I’m a big believer that you can be serious but have fun at the same time. You can be smart but laugh and on a Saturday morning that’s what people want. They want you to treat them seriously. They don’t want you to throw junk at them just to fill two hours of TV. We’re not doing that. We don’t have a big staff but we think really hard about everything we do. MR: Where is the show ultimately heading? AM: A two-hour television show is a monstrous beast. I was kind of terrified of it when they asked me to do the Saturday show. I was an English major in college, I strove to write stories with a beginning, a middle and an end and construct them in a way that they held up all the way through. I’m the kind of guy who if he goes to the movie he wants to stay to the end because I want to see how it’s made. The few times I’d subbed on the show in years earlier it was frankly kind of a mess. You’d be in the middle of it and you’d go, “What is this show about?” We’ve got fashion segments, we’ve got cooking segments, we’ve got a couple of guys helping you rebuild your house, I don’t know what this show is about. It’s trying to be about so many different things to different people but you can’t tell at the heart of it what it really is. I think more than anything you have got to find what that is and you’ve got to try to stay true to it every week. You’re not always going to hit it. Some weeks are going to be better than others and you’re always going to ask yourself, “Why did this show work better than that show?” but we are trying to build out, segment by segment, a definition. We’re off and running with music, we’ve got food, we want to continue that to film, we want to do some different things with film and movies other than just having a list of something every week. I’m not sure what that is yet but we’re trying some things and working on that. We also have a commitment to technology and science, again, having fun with it and making it accessible to everybody. We have this guy Jeffrey Kluger from Time, he’s their science writer who is terrific and can make anything scientific interesting. Jeffrey’s on once a month and I love him, he’s great. When I first started understanding what made two hours of television work it was the week Jeffrey was on and he was talking about Mars. We had him on, we had Thomas Keller, the great chef, and we had a really fun band called The Piano Guys who just were great TV. MR: The Piano Guys can be lots of fun. MR: No, I really enjoy the passion and appreciation you have for all that goes into the process. I think you’ve made it apparent what your mission is–to explore music and artists in the best way you possibly can. AM: I love and admire musicians in part because I am utterly unmusical myself, I can’t hit a note to save my life. My daugther will tell you I couldn’t sing if my life depended on it. MR: Nope, you’re just being modest. If you can talk, you can sing. AM: That’s absolutely true. And I’ve always considered the pieces I do, particularly for Sunday Morning, as my songs. There are a lot of similarities in the way a song is constructed and the way a piece of television is constructed, which is why I totally relate to songwriting and I love having conversations with musicians about the way things get built. I did have this one producer in our London bureau who’s in a band and when I said that to him he said, “You know, you’re not wrong. It actually makes sense.” A story has a rhythm to it, it has a visual rhythm, it has an audio rhythm. I’ve always heard all of that in the way a story feels. That’s why I spend as much time working on them as I do. Mike Ragogna: Chase, let’s start with your involvement in the Snagajob contest. How did that come about? 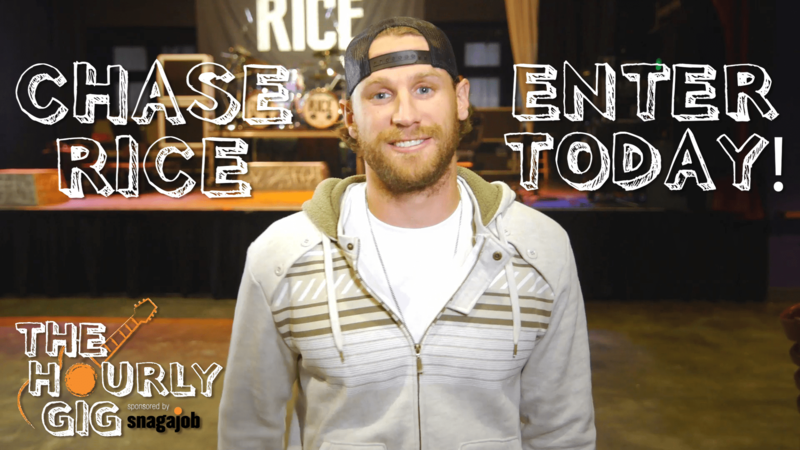 Chase Rice: Yeah, we teamed up and we’re going to give somebody the opportunity to open for me later this year in Denver. They’ve got to basically do a version of one of their original songs, submit the video and then the judges decide who the top five are. Then on August 22 we announce who the top five are and then the fans vote. They say who they think the number one person is and that person gets to open for me in Denver to a sold-out crowd, and it gives them the opportunity to break into the music business. MR: What will the opening act spot be like? CR: It’s one show, probably thirty to forty-five minutes, a typical standard deal. The cool part is they get to play to a sold-out Denver crowd, which will be nuts. MR: Are you and your musical director going to work with them to make sure they’re ready? CR: It’s up to them. I get to be a part of choosing who the top five are and then it’s up to them. They’ve got to promote as much as they can to try to be the top dog and get that opening slot. Then once they win, it’s a hundred percent on them, I’m out of the way. I just want to see them perform and see them get the crowd amped up in Denver. MR: Since, basically, this contest will probably involve new-ish artists, let me ask you my traditional question now. What advice do you have for new artists? CR: Just do it your way. That’s the way I’ve done it. I’ve had so many people tell me I’m not doing it the right way, that I need a label or something. If you have a vision for how you want to get your music out there, put the people around you who can help you get that vision out there and stick to it. You’ve got to surround yourself with those good people. MR: What is the Chase Rice story? Any memories of how, possibly, your advice worked for you? CR: I was just touring. I just wanted to tour and get my music out there instead of getting in on the radio right away. While I waited on that part–which is happening now with Columbia records involved–I wanted to tour and give my music to the fans and every single person I could. That’s what I’ve done. I’ve had some great shows, I’ve had some really horrible shows, but most of them are great. MR: Your new project Ignite The Night is coming out in August. Can you give us a little tour of the album? CR: It’s packed full of party songs, because that’s going to help build my career. It’s for the live show, I need those songs to do my live show the way I want to, because I want people to have energy, I want people to be raging for as long as they’re there. At the same time it’s got some depth on it, it’s got a song like “Carolina Can,” which is kind of my life in songs. It has more “story” to it. Country music deserves ballads like that. “Jack Daniels & Jesus” is on there. That’s a song that shows a deeper side of me, as well as a party song. MR: When you’re writing, how deep does it go? CR: It’s always different. If I know I need a party song, I’m going to do my best to have the most amped up, energetic melody–the same stuff that I hear when I’m drinking and partying, whatever the topic may be. Then there are songs that are just me and an acoustic guitar and I put out whatever feelings I’m feeling. That can always happen in a lot of different ways. It’s usually whatever mood I’m in. If I’m in a happy, party mood, I’m going to write party songs. If I’m feeling down about life, whatever it is, then it’s going to be a way more meaningful song. It can happen both ways. MR: The single “Ready, Set, Roll” is already a hit from this record. How did that song come about? CR: That was written with Rhett Atkins and Chris DeStefano, who’s now my producer. He started the track; we already had a bit of a melody going with guitar and he started building the track and what you hear on the radio while you were writing it. Rhett Akins was there, too. It was an all-day affair. We were digging it in, we wrote the chorus and then we got to the verses. It didn’t come easy, we had to really think to come up with some different lines. I think we did a good job of that. MR: Do you think the songs on Ignite The Night have evolved compared to your previous material? CR: Oh, yeah, the writing’s way better. We try to come up with lyrics that make people wonder how the hell we came up with it instead of just thinking of the same old standard stuff. We put lyrics on there that make people say, “What the hell did he just say? Why did he say it like that?” At the same time, the melody’s got to fit along with it, too. The better lines I come up with myself challenge the other writers to come up with cool lines like that, too, and the better lines they come up with challenge me to step up my writing. The better a writer’s writing with, the better the song usually is. MR: You co-wrote Florida Georgia Line’s “Cruise.” How do you look at that song now that it’s been a hit? CR: That was one of the ones that found us. We were writing a slow song and then that song kind of popped out. We wrote it in forty-five minutes and then went back and finished the slow song. That one happened by mistake, but the songwriting gods happened to be smiling down that day. MR: [laughs] They must have been, it’s the most-downloaded country single of all time! CR: Yeah, and I’m proud to be a part of that one, but at the same time I wrote a different song the next day. You can’t hang your hat one song. I’m blushing to be a part of it, but it’s onto the next one for me. I always want to write something better. That’s what I’m working on with this Ignite The Night album. CR: I’ve been a huge country music fan my entire life. When I was done with football and NASCAR I was playing guitar and writing a little bit through that and I knew I wanted to be better than I was, so I had to move to Nashville. That’s when I started writing with great songwriters and they taught me what it was like to write a good song. Music’s a passion of mine, especially country music. I didn’t have anything going on, so I figured I’d move to Nashville and give it a shot. MR: Where do you take it all from here? CR: Continue to focus on “Ready, Set, Roll,” and the whole album. Get “Ready, Set, Roll” up the charts as high as we can possibly get it, hopefully, peak number one and then go on to the next single. Try and make the songs of Ignite The Night heard by as many people as we possibly can. That’s the short term goal right now and that’s all I’m really focusing on. MR: Good luck with everything, man. One last question: Snagajob is about employing people. Do you see yourself participating more with socially-minded initiatives like this through contests, etc.? CR: Yeah, absolutely. Social media is so big these days you can get information out much easier. If it helps someone else get the same shot guys like Dierks [Bentley] have given me, absolutely. Why wouldn’t I want to do something like that? Mike Ragogna: The Power & The Glory is getting a huge reissue treatment–expanded with a Blu-ray of remixes and more. How did the idea to majorly celebrate this album begin? Derek Shulman: It actually started from a fan and a co-conspirator in our musical world, a guy called Steven Wilson who was the leader/main man of a band called Porcupine Tree in the UK. Fantastic musician. For whatever reason he was enamored by our band who in fact hadn’t performed and hasn’t performed since probably about 1980, so that’s thirty four years. He kept asking my brother, who has worked with him on several projects, “If you have the original 24 tracks, please let me remix some albums of yours. I think I can help put a little edge on some things that you might want to have had back in the day and you didn’t have time for, etc.” We figured, look, he’s a very good musician, a guy who we admire, so I said, “Hey, listen Steven, give it a shot, whatever you want to do. Make it the way you want to do it.” We gave him the tapes. We actually had them back in our possession from our license, so we actually own the masters. He basically kept pretty true to what the original style was but amplified and expanded it all with bits and pieces of things we wouldn’t have done back in the day. It came from him, that’s the bottom line. We would never have touched it. He was the propagator of this release and others, which are forthcoming. MR: There are more coming? DS: Yes, indeed! The fact that this has gotten so much press and excitement from our four fans out there… [laughs] No, the fact that it sounds better, not the least because we’re having someone look at it objectively. We figured, “Yeah, listen, why not give other albums a shot,” and at the same time utilize my brother’s skills at illustrating via motion graphics and video to highlight the songs and the stories. MR: Do you feel that Gentle Giant’s music lends itself to visuals and effects like how he approached it? DS: Yeah, actually. That’s an interesting question, which I’ve never been asked. I think it does because the songs…well, they’re not really songs, they’re music. If you listen to the music of Gentle Giant, you’ll hear the vocal lines are always part of the musical entity. I don’t want to sound pompous or pretentious, but we compose in a classical mode, so there were always themes and even the vocal lines were partly to do with the themes of the musical composition as opposed to a song line and a chord pattern and a bass drum and a kick drum and a bass line, there was always a theme to whatever piece we had. So yes, I think it does. MR: Would you consider your music to be prog rock? DS: [laughs] I still am quite scratching my head about that term. MR: In your opinion, how did “prog” get such a bad rap? DS: I think the connotation was possibly from artists in the same ilk. I don’t know if we belong in that same ilk or not. We weren’t trying to be any kind of category band. But I think the term was kind of derogatory back in the day primarily because some of the music was pompous, to be honest with you, with mellotron keyboards that dragged on for five or ten minutes and meant nothing except that it sounded like a string orchestra, which it wasn’t. We never did that. First of all, we never took ourselves that seriously. Even though we were fairly decent musicians. I think we’re self-deprecating to a certain degree but we were also musicians who pushed ourselves to be better for ourselves first. That’s something we were pretty cocooned in. As far as wanting to be something or have a title, that wasn’t on our radar at all. However we’re termed, we don’t care as long as somebody enjoyed it. At least we five musicians enjoyed it. MR: What was the creative process like? Did the lyrics drive the music or vice versa? DS: They went hand-in-hand to be honest with you. I think usually the musical content would come from Kerry Minnear who was our keyboardist. He was a graduate from The Royal Academy Of Music in composition studying under Sir Michael Tippett. My brother Ray was a classically trained violinist. They’d come up with a couple of ideas and they’d combine them together and then I’d come in with some ideas musically. The ideas, which were paragraphs, would lend themselves to a lyrical topic, so gradually these pieces of music evolved on their own, but it came initially from music first. To be honest with you the actual instruments evoked some other lyrical content and then we’d try to integrate those two things into one piece of music. It was kind of like an ebb and flow of whatever came first. But generally it was from the composition first. Then after a few lines of the composition, a lyrical idea would come together and then we’d integrate the rest of the song and the music into the lyrical content and it would all come together. MR: And then did the songs drive the concept of the album? Once you found a couple of songs that fit together, was it then time to fill in the blanks? DS: Well, The Power & The Glory, in particular, was a “concept,” although that is kind of a hack term in certain respects. It was one that I thought was important because it was the days of Watergate and a lot of other things were happening during that period. It was the corruption of power and the people who are hoping that the people who are on top would help them, but ultimately got nothing was something to be said in that day and age, and also something to be said in this day and age. It’s kind of like an overall story. We were fairly educated as people so it came naturally to make the songs sound fairly interesting both lyrically and musically. MR: Gentle Giant albums were released on a couple of different labels, including Columbia. Did all of those masters return to you? DS: Just about most of the material did. There are still a couple of albums, which are in Sony’s grubby little hands. [laughs] For the most part, they came back to the band in North America, that is. We were able to extricate them to our own grubby little hands and at least get a few pennies out of the meager sales that are ongoing. We were fairly fortunate in that respect with Capitol and Sony/Columbia. I’m making fun of them, but they’ve been very helpful, actually in that respect. MR: I remember an international, double disc collection that went back all the way to the beginning. It was a really nice piece. 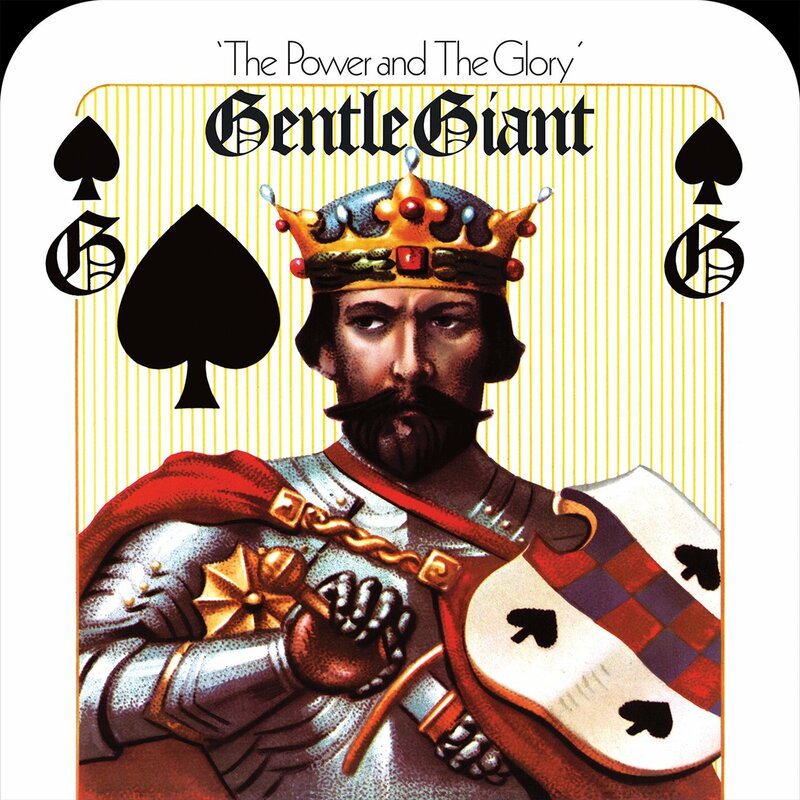 It’s unfortunate that the United States has never had a proper compilation of Gentle Giant. It would be a nice education, and I think you’d probably be surprised at the appreciation of it by old and new fans. DS: There are plans with me and my brother Ray to put all our grey heads together and say, “Okay, look, apparently we didn’t die, and apparently there’s still interest in this band.” There are a few things we have under our stoles to make happen. In fact some of the more interesting things are a cut that came out of the blue. I want to tell you that this music has affected some other forms, in fact, much more contemporary forms of music. I went by The Tonight Show a couple of times. Jimmy Fallon and Questlove and The Roots were there. Questlove–Ahmir Thompson–is a humongous fan apparently, which I had no idea about. He requested for us to send him the stems of The Power & The Glory. He said he wants to remix the album himself as well as Steven Wilson and do hip hop/contemporary version with–I don’t know if he’s going to bring in the DJs or Jay-Z or God knows what. Whatever it is, there’s lots of things that possibly can happen in the next twelve to eighteen months. MR: That’s wonderful. What advice do you have for new artists? DS: Well, obviously, the record business these days is almost nonexistent, but music is still integral to everyone’s life. As far as new music is concerned, I would say don’t just look to get your music on YouTube or Facebook and hope you’re going to be famous because you’ve had a hundred million views, because it doesn’t work that way. What you have to do first is make yourself a better muscian for yourself first. If you’re in a band, make sure your band becomes a better group, musically, in whatever genre you’re working in. Be great, not good. You’ll never have any success if you’re just good. If you want to be the leader in any field, whatever it is, you really have to not look at someone else’s place on the charts and say, “Wow, I could be that,” you have to do it on your own, and you have to do something that is only yours alone and be great at it. In some respects–and this is on an ego push myself–you asked about being a part of a prog movement. We didn’t know what prog was, we were just a bunch of musicians who said, “Let’s get together and make a band.” We had no idea what it would sound like, but we had a bunch of really good musicians making ourselves better for each other. And if we made ourselves better for each other, perhaps the city would like to hear it, and then it went from there. We really worked hard at it and played and toured and, lo and behold, some people came along. The year after that, a few more people came along, and we were able to build a career and make a living. And we didn’t listen to the radio apart from toward the end perhaps. The music I guess still lives in that respect. In so saying, it appears that if you do that, the music will survive. MR: What does the future look like for Gentle Giant? DS: There isn’t one, really. DS: No. The thing that is important–certainly to me and my brother Ray–is we closed that chapter. You can’t rewrite history and if you try to, it becomes really besmirched. I don’t want to be a parody of myself and I don’t think any member of the band would want to be a parody of themself either. We can teach and, hopefully, younger artists will be enamored by it. But to try and replicate what we did or be who we were back in the day would be impossible. I don’t want to be a grizzled old man trying to jump around on stage and play the same music and smear whatever minor legacy we have. I don’t think that’s going to work at all. Mike Ragogna: Gage, you are one of the newest “alt” fashion mavens of the Midwest. How in God’s name did this happen? William Gage Blanton: [laughs] Alt fashion maven of the Midwest, huh? [laughs] Okay, well, not overnight. Persistence, really, that’s it! MR: What got you into clothing design? WGB: Dropping out of college. I was going through college and paying for college for something that didn’t make sense to go to college for so I left. I was paying thirty-two grand a year to go to school for fine arts and I started my company while I was doing it, so I was focusing on my company in class. It was a natural transition from what I’d been doing as a kid, which was design work. MR: How did it all start? WGB: It was a natural progression from me doing doodles. I’ve always been into fashion magazines and whatever fashion is going on in the world. My mom was a buyer for Nordstrom growing up, so it was always ingrained in me that this is an important part of life. MR: Did your eye for art always go towards design, or did you start out drawing dragons, superheroes, stuff like that? WGB: No, it was definitely design. I started out with cartoon stuff for a little while but that got boring and it went to things that made more sense to me, which was drawing people. When I drew people, I would focus on what they were wearing and form the person out of that. That’s what I did through middle school and high school. MR: You also have a knowledge of anatomy in order to properly design clothing that would fall right on the body. How did your introduction to anatomy come about? WGB: My cousin was a science teacher, so I had one of the anatomy and physiology coloring books as a kid. I went through a couple of those. It was a natural process because me being interested in it made me want to learn about it, so I would just study things and teach myself things I didn’t already know or have an understanding of. MR: Do you have Ny brothers or sisters that you designed for? WGB: I’m an only child. MR: Did you make your friends guinea pigs for your early designs? WGB: No, I really kept them all to myself for a long time. Nobody really knew about it until college. MR: What about college? Did you use your friends as models? WGB: Yeah, I did. I used my friends as critics, too. That was the main part; trying to get friends to tell me they didn’t like stuff. That was the hardest part. MR: I know you do everything, baseball caps, shirts, blouses, what were some of the first items you were interested in creating? WGB: Honestly, my inspiration from it was runway shows, the mod, European, dark fashion shows. That’s just because they weren’t necessarily pieces that could be worn, it’s more about the shapes and tones of what they use. Raf Simons is one of my big inspirations. MR: Did you ever strut the runway? WGB: I’ve done a runway show, yes, last year, and I’m doing another one this year. MR: You’re currently located in New Orleans. Has the culture affected your designs or how you’re approaching things lately? WGB: I guess, in a way, it has affected it because I’ve felt freer to be able to do what I have always liked and not have to tone it to more of a Midwest stance of what I know would sell. I feel like I can put out what I like and it will be accepted. MR: You grew up Portland. What got you out to the midwest? WGB: Well, my grandmother moved out here because of Iowa. She moved out here before anyone else did in my family. I had dropped out of high school senior year and she was like, “Well, you need to go to college.” So she made me come to Iowa and I finished up high school there. MR: Who are some of your favorite designers? WGB: Right now Raf Simons, Alexander McQueen’s new line is really inspirational. But Raf Simons is probably my all-time favorite. As long as I’ve been doing fashion, he’s always been an inspiration. I don’t like colors, I don’t like bright and gaudy things, I like the dark, and especially the shapes of the cuts of designs. MR: This is related to my earlier question, maybe I’m just rephrasing it a little. Since you moved to New Orleans, have you experimented with concepts you never had before? WGB: I actually have. They haven’t made it past certain stages of design, but I have. It’s because of the culture there, it’s very European culture, I can push the envelope more. MR: Where is your clothing right now? What kinds of stores are they located in? WGB: With the new release of the line, I’ve got a new PR manager so I’m getting my stuff in two stores in New York for the new line. I took clothing back to a couple places I had stuff in previously, so my new line is going to be in just New York and Europe. MR: Gage, what is your goal? WGB: The goal is to really do things that are timeless. A shirt is something that everybody has to wear, and a shirt is something that people can wear for twenty years if it draws them, or somebody can wear a shirt for a day and never wear it again. I aim to be that article of clothing you keep for twenty-years. MR: Do you feel like you’re working on something right now that fits that description? WGB: Yeah, the line I’m working on right now is very contemporary, probably not what people would expect. It’s very simplified and contemporary, but it’s more of a satire. The line is “Prescription Error,” it’s kind of speaking on the age we live in, where prescriptions run everything we do from the most minute to the largest sections of life. MR: What’s your advice to designers who are just starting out? WGB: Don’t be afraid to fail, because you have to fail to succeed. You can’t just expect to make it. You have to know how to fail. You have to fail, fail, fail, fail, fail. And copy whatever you love. If there’s something you like, and somebody who inspires you, just copy it as much as you can. From that copy you will find your own style, your own way. MR: Nice. You’ve also had a music connection in that your fashion sometimes goes hand in hand with certain musical acts. WGB: Yeah, I dabble in music, and I’m friends with some major artists and some not-so-major artists. I just like the way that in this day and age music can dictate what’s going to be in style. The imagery used in music is probably the most influential pop culture we have. MR: Smart. What does mom think of all this? MR: But she’s wished you luck and crossed her fingers for you. WGB: Yeah. I think at this point she gets that I’m not going to be giving up any time soon. It’s what I do, it’s what comes naturally to me at this point, i’ve been doing it long enough that I see everything in shapes and design. I can’t help but walk down the street and see something. MR: Do you ever picture her buying any of your clothing lines someday? WGB: [laughs] She’s a yoga teacher now. She doesn’t do buying but I do actually know buyers at Saks. That’s another thing, making connections has been a blessing of mine. I’m able to walk into places and make connections with the right people without me even knowing who to talk to. MR: So everything has fallen in line for you. MR: Any info about the new line? WGB: This new line is going to be something that’s not expected if you know any of my previous work; it’s definitely going to be on a different scale.